Is Painting A Basement Floor A Good Idea Or Not? A Good Idea Or Not? Well, painting a basement floor can be a good idea if you take some time to investigate a few things first. If you just decide to go to the hardware store and pick up some concrete floor paint I think you'll be disappointed. I know, painting the concrete floor in your basement can really enhance the look of your finished basement. There's a lot of colors to choose from and if you're artistic at all you can really be creative. Now this is a little extreme, but as you can see anything is possible! Although the task of painting the floor can take 2 or 3 days to complete, in the long run it is well worth the effort. Here are some tips on how painting basement floors can be done by yourself. 1. You should check to see if the floor is damp. If it is, then you have moisture related issues that will have to be addressed first. Basement floor paint will not adhere to moist or wet concrete, it will peel off shortly after you install it. Click on WATERPROOFING BASEMENT FLOORS to see how to address moisture problems. 2. Clean the basement floor with a mild solution (9 parts water to 1 part acid) of muriatic acid to remove any oil, grease, and dirt. This also opens up the pores of the concrete so the basement floor paint will bond to the surface. You'll have to neutralize and rinse the acid solution off with baking soda and water (1 cup baking soda to 5 gallons water) after cleaning the floor. You should wait 48 hours after washing & cleaning the concrete to make sure it is completely dry before applying any paint. Click on CONCRETE SURFACE PREPARATION for more tips on cleaning before painting. Any previous coatings, paint, or sealers will also have to be removed before painting the basement floor can be done successfully. Click on CLEANING GARAGE FLOORS for tips on how to remove coatings from concrete floors. 3. If your basement floor has any cracks, they will have to be repaired before you can use a basement floor paint. Click on EPOXY CONCRETE REPAIR to learn how to fix cracks in a basement floor. 4. I like an epoxy floor paint when it comes to painting a concrete basement floor. I would stay away from the 1 part epoxy paints. They don't last and you're re-painting every year. 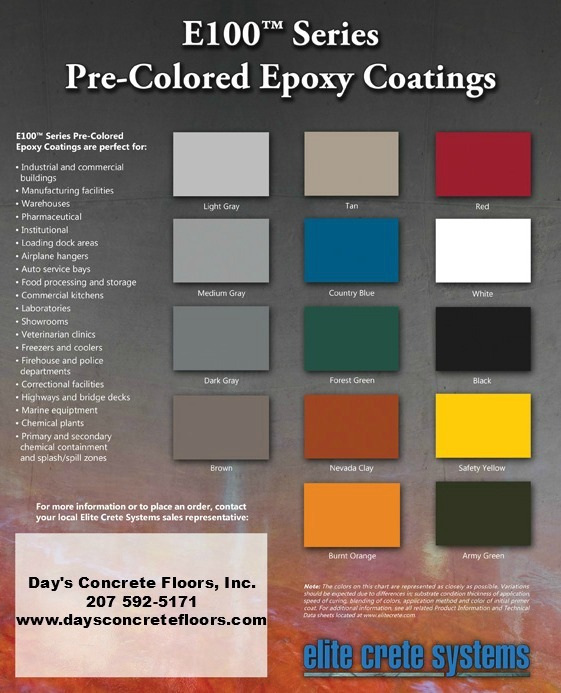 EPOXY GARAGE FLOOR PAINT can also be used on basement floors. It's very durable, easy to clean, and comes in many different colors. A 2 part water based system would work just fine on a basement floor. Using an epoxy floor paint consists of painting on a primer, then a topcoat, and finishing with a sealer. 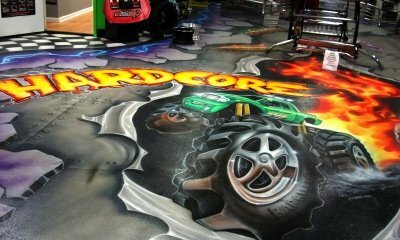 This is the epoxy floor paint that I use. Like I said, don't just go to a big box store and buy the epoxy paint thinking it's as simple as they make it out to be. There's a little learning curve to this kind of paint. Luckily I've written it all out for you in a step by step format. Click on HOW TO PAINT CONCRETE FLOORS to learn the steps in this process. This is a general guide. Most epoxy paints are similar but always make sure to read their instructions before you open the container. You can have fun when you're painting a basement floor. Get creative by adding a border or some designs on the floor. You can add decorative chips to the epoxy paint to get a granite or marble look. Painting your basement floor can be a great way to get a professional looking floor, that you can do all by yourself.